Just installed this week. Huge improvement over the stock windshield. I'm 5'9" and in the low position it is about 2-3" below eye level. Significantly quieter with much less turbulence.  No helmet buffing. I'm looking forward to a long trip to really test it out!. Looks nice! Do you have any issues with the handlebar hitting when you turn the bar hard? Looks like it has some interesting curves to the windshield too. I have concerns with these huge screens as to how much strain they put on the mounting bracket, the pressure caused by these at speed is enormous. I've been running the barn door Givi WITH a MRW "Tour" bolt-on adjustable spoiler for about 20,000 miles with no structural issues. I'm 6-1 with a long torso so I have it in the upper adjustment notch with the spoiler about 1.5" above. Great protection, no buffeting but still a bit noisy, though helmet selection and wind direction greatly effect noise levels. Only draw back is that in temps over 75F it can get too warm behind the Givi. Consequently, I have a double bubble clone of the OEM shield that I have not tested yet and a bikini screen that keeps my helmet and upper torso in relatively smooth free air that is not too noisy for hot weather. 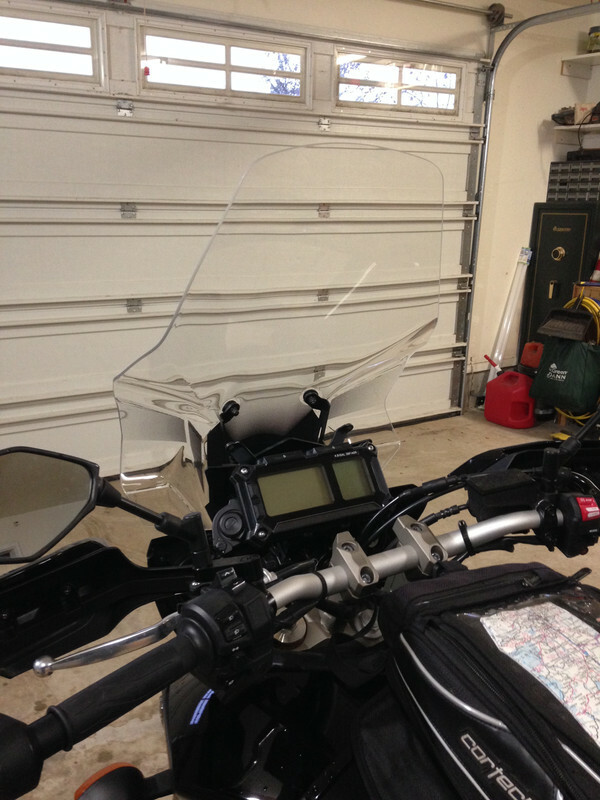 One caution about the Givi screen. It micro scratches VERY easily. Clean it only with Sprayway foaming glass cleaner (no ammonia or abrasives) carefully using a soft toothbrush for stubborn dead bugs, and wipe dry with a clean premium micro fiber towel. Follow with liquid polish/wax like Plexis. A Giant Sand Crane hit the Givi screen and left mirror while I was doing about 60 mph and the Givi came through without a scratch and I managed to stay on the tarmac, rubber side down. The Crane did not fair so well... When it hit the OEM left mirror, which was on a Bike Master mirror extender, the extender spun counter-clockwise and broke the left control pod rocker switch (which still functioned but had a sharp edge and was open to water). I think a new switch was less than $60. A cheap result given the potential for disaster. My buddy who was riding behind me said it looked like I killed a prehistoric Pterodactyl in mid-flight. BTW, beside the well know OEM shield adjustment knob mod, I also use about 70 durometer neoprene foam rubber wrapped in polyvinyl foam sheet drawer liner folded and wedged between the back of the shield support and instrument housing on both sides that minimizes and dampens the very annoying forward-back slop in the shield adjustment assembly I've felt on every pre-2018 FJ-09 I've checked. And Linby, your man-cave is way too big, clean and organized. Are you married with children? Guess not. And get some KTM hand guards and Delrin nylon bar end sliders. No, the windshield shape prevents that. 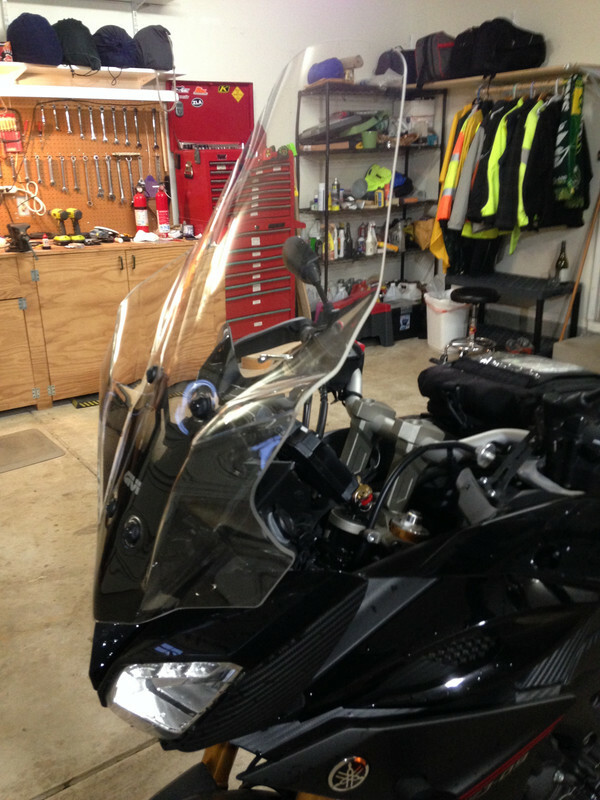 In fact, I have this windshield and Givi's larger handguards and they're all designed to work together. +1 to the OP. Huge improvement over stock. No issues with any interference with the handlebars or anything else for that matter. I just got back from a 200 mile ride trying all three height positions and no issues with any position. Brough it up to over 110 and no appreciable wow or flutter no bike instabilities that could be attributed to the large shield. It is a very nice design. No. Married. Kids are all adult in age only, but not with us. My garage is a freaking mess! But now my dilemma is I won't have any time to clean it as I'll be riding the FJ09 all the time! BTW my wife is an angel! She actually encouraged me to get the bike. And yes she has a sister, but the sister is a lunatic! I have the Kappa equivalent of this screen. Works well indeed. Last time I saw wow and flutter together was on a turntable spec sheet. Jumped right out at me. A mess?! Don't come near my shop or garage then, you'll die of a heart attack. Seriously, yours looks way neat and tidy. My kids are out of the house too, and my wife may do yours one better because she it a saint. She never says anything about what I spend on my "hobbies" (I saw your gun safe), always pays my life insurance premium, and sweetly says as I'm walking out to go for a ride "Have fun and make me a rich widow". I have this shield as well, and love it! I can actually hear the bike instead of just wind noise all the damn time! Did over 200 miles again, yesterday. The screen was amazing! I have my SH36 bags on the bike as well. Empty. I'll have to fill them up with gear and see how it affects the ride. Loving this bike so far! 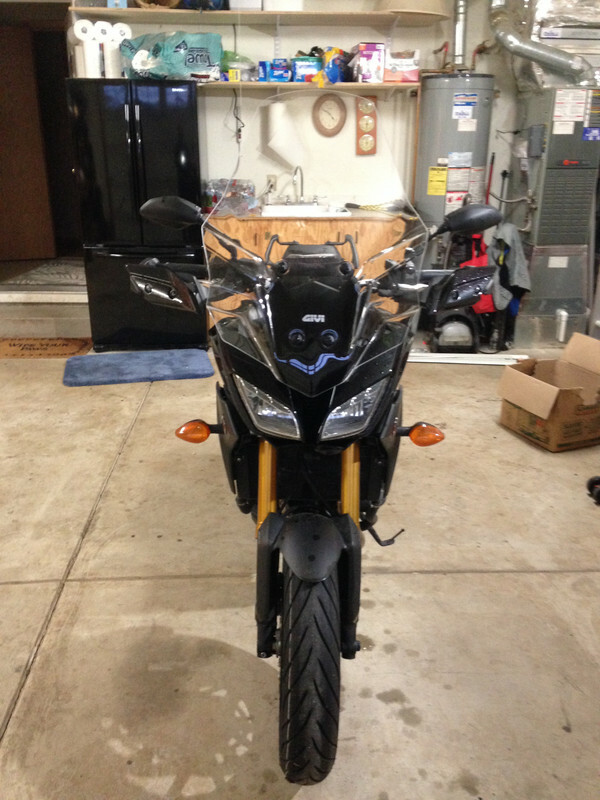 I just installed the Givi2122DT this past weekend. Took it for a ride and initially set it to the middle position, then to the high position (haven't tried it on the low yet). Works real well however I am getting a lot of Helmet Buffing. I'm 5-11 with the seat in the lowest position. Any suggestions to get rid of this are appreciated.